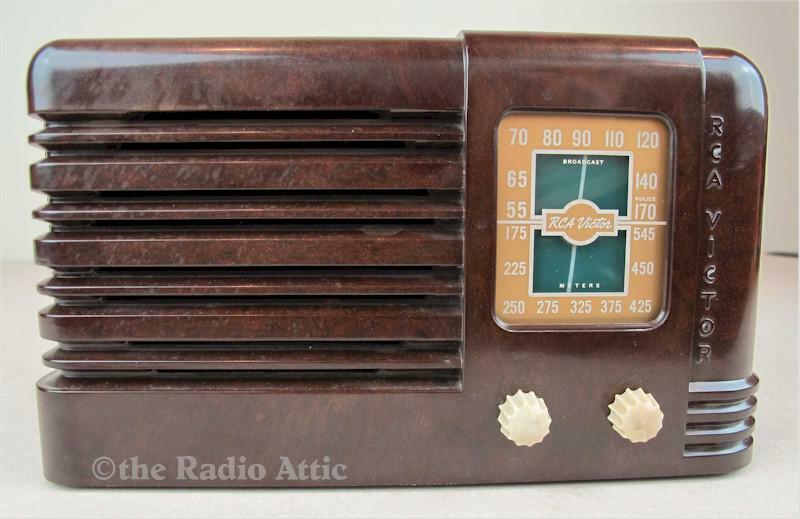 If you love miniature Bakelite radios, this one is for you. These diminutive sets sold for $9.95 and RCA called them the "Little Nipper" radios. Advertisements boasted about the rear RCA jack by stating, "Now you can enjoy records too through the Victrola plug-in." The cabinet is in fantastic condition and features the nifty "tractor tire" knobs. Surprisingly, this radio performs far better than you'd ever expect. A prior owner did a spectacular job restoring the chassis. You won't find a nicer example of this darling set. The radio weighs 5 pounds; 8-3/4"W x 5-1/4"H x 4-1/2"D.